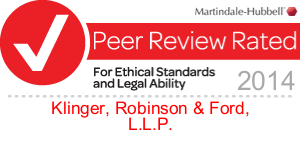 An A-V® Rated Firm Offering Dedicated Legal Support Since 1979. At Klinger, Robinson & Ford, L.L.P., our attorneys have been offering dedicated legal assistance to clients in Cedar Rapids, Iowa, and the surrounding area since 1979. As a home-grown and locally owned firm, we understand legal situations that are unique to Iowa residents. With your best interests always in mind, our firm leverages more than 100 years of combined legal experience to address your concerns with the great detail they demand. We Solve Problems. We Protect Your Rights. We are a general practice law firm with practice areas including, family law, personal bankruptcy, business bankruptcy, creditor rights, real estate, landlord-tenant law, criminal law, estate planning, business entities and transactions, agribusiness and agricultural law. Ready to take the next step? You can start this process. Iowa State Bar Association President-Elect Bruce Walker has appointed attorney Chad Zenisek to serve on the Commercial & Bankruptcy Law Section Council for the upcoming 2015-2016 fiscal year which begins at the June Annual Meeting. President-Elect Walker has appointed Kristina Stanger to serve as Chair of the Section for the upcoming year. Klinger, Robinson & Ford, LLP is licensed with the American Land Title Association ("ALTA"). We can use the ALTA standardized forms. Without these standardized forms, the lending process would take longer and the secondary mortgage market process would slow, making the market less fluid because there would be less money available for lenders to loan. In January 2015, attorney Jon Hammond filed a motion to suppress evidence of an OWI (operating while intoxicated) gathered during a roadblock in Cedar Rapids, Iowa. He argued it was an unreasonable search and seizure, which is prohibited by the Fourth Amendment of the U.S. Constitution, and Article I, Section VIII of the Iowa Constitution. The Court granted the motion to suppress, ultimately causing the case to be dismissed and driving privileges reinstated.